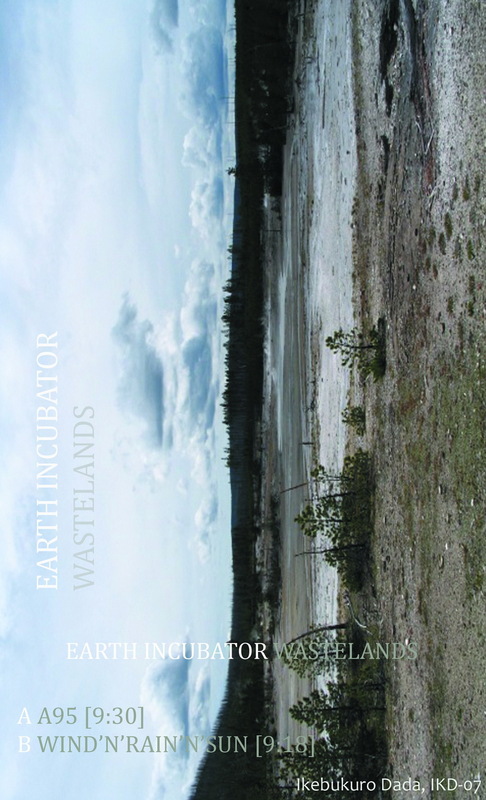 Wastelands is a C20 from Earth Incubator, a harsh noise/wall/drone project that often features some theme about Earth or nature. Two sidelong tracks make up the tape, which comes with a j-card that has a picture of the eponymous wastes on it, plus a white tape with markered side labels. “A95” is a mixture of harsh noise sounds and static walls, and it begins with a whirring before falling into a static percussion that sounds like an intense rain storm. Static alternates between thin whisps and thicker bursts, but the difference between the two feels like just a tweak of a radio knob. A deeper boom fades in with a static strand behind it, and this also holds for a short time before we return to the rainstorm. However, the end of the track tends to fade into oblivion, with Earth Incubator twiddling knobs and incorporating short, low-volume bursts of static. Despite the dynamic, it’s nothing one hasn’t heard before for static, and the changes aren’t very distinctive besides seeming like the source was switched to a new AM channel. B side is “Wind’N’Rain’N’Sun”, and trust me, that’s not fun to try and write. But this is a track similar to the first in that it imitates the noise of thunderous storms, this time with a bit more fury from a raging static line melded to a windswept judder. Again, it’s not completely a wall, as the noise does tend to oscillate and shift with separate waves of static, spurts of tremors, and other not-so-subtle changes to the texture. Most of this only lasts for a few seconds before shifting back to the storm, although there is a very jarring transition from static to empty space and back to static before feedback kicks in, only to stray back to the harsh rainstorm again. I must say that this track is the better of the two; it’s harsher, more abrasive, and feels more focused than the other, while also maintaining a better sense of technique. However, as I mentioned before, this is certainly standard static noise, not something unique or inspired. Wastelands feels entirely like its namesake – two tracks that take somewhat bland static noise, thrown together into a cesspool. It’s certainly listenable, especially at only 20 minutes, but it’s not extraordinary or even very interesting for harsh noise.